Carburetor is the device that used to mix air and fuel in an internal combustion engine. The main objective of the carburetor is to provide quality air-fuel mixture for cruising range and for other special requirements likes at starting, idling, acceleration, variable load, and speed operation condition. Above figure shows a simple carburetor. The main parts of a simple carburetor are carburetor air filter, float chamber, fuel discharge nozzle, metering orifice, choke valve, throttle valve and venturi. The float chamber is vented to the upstream side of the venturi or to the atmosphere. Float and needle valve maintains the constant gasoline/ petrol level inside the float chamber. The float goes down as a result of the decreasing amount of fuel inside the chamber. When the fuel level goes down the designed level, the floats go down, actuate the fuel supply valve and admits fuel into the chamber. When fuel reached the designed level, float closes the fuel supply valve. The tip of fuel discharge nozzle from the float chamber is located to the throat of venturi. The tip will be slightly above the level of fuel in the float chamber to avoid overflow. The throttle valve is regulated by the mechanical linkage (cable) or pneumatic link to the accelerator pedal of the vehicle. 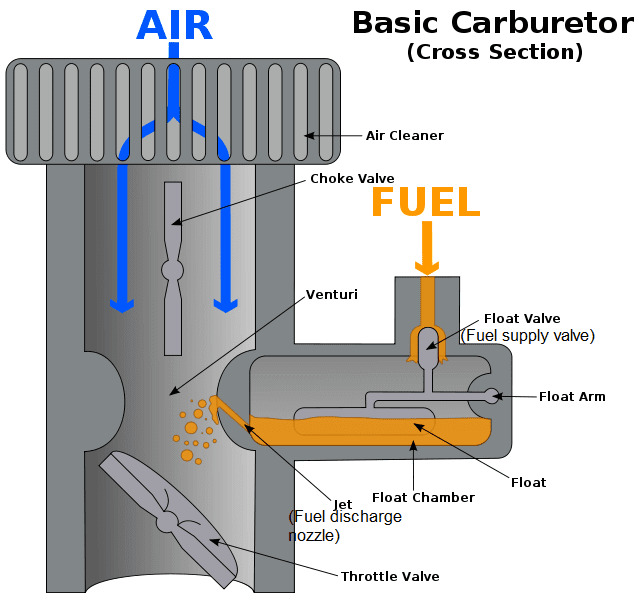 Simple Carburator work on the Bernoulli's principle. During the suction stroke, air is drawn into the cylinder through venturi (also known as choke tube). venturi tube is designed in such a way that it offers minimum resistance to the air flow. When air passes through the venturi the velocity of air increases and the pressure decreases [read venturi meter working principle]. At venturi throat the velocity of air reach maximum and the pressure reach minimum. There will be a pressure difference between the float chamber and venturi throat. This pressure difference is known as carburetor depression. [What is meant by carburetor depression?]. Because of this pressure difference fuel is discharged to air stream through fuel discharge nozzle. The amount of fuel discharged depend upon the size of fuel discharge nozzle/ fuel discharge jet. How simple carburetor give different air-fuel ratio? The accelerator (throttle) of vehicle does not directly control the fuel supply. Instead, it actuates a mechanism that controls the air flow into the engine. The speed of air drawn into the cylinder determines the amount of fuel mixed in the air. The amount of charge delivered to the gasoline engine cylinder varies with varying power output (quantity governed engine). This is achieved by using a throttle valve after the venturi. When the throttle valve opening varies, the air flow rate also varies. The increase in air flow rate decreases the pressure at the throat (increase differential pressure) that make the flow of fuel vary in a similar manner. However, as the decreasing pressure at throat decrease the density of air whereas the density of fuel remains unchanged. This results the simple carburetor produce a progressively rich mixture with increasing the throttle opening. Why atmospheric pressure effects the working of simple carburetor? Simple carburetor working on the Bernoulli's principle. The amount of fuel drawn into the air stream will vary with varying differential pressure across the fuel discharge nozzle. If pressure at one side (atmospheric pressure) vary, the differential pressure also varies. The density of air also varies with atmospheric pressure.